To move a node manually, see the corresponding nodetool move command. If OpsCenter role-based security is enabled, be sure that the permission for the Move option in Cluster Topology is enabled for the appropriate user roles. See Calculating tokens for single-token architecture nodes to determine the correct token value. The Move menu option is generally used to shift tokens slightly. In the List view, select the node. From the Other Actions menu, click Move. 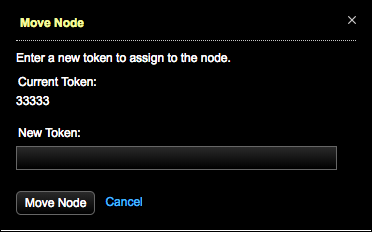 Tip: The Move option is also available from the Actions menu in the Node Details dialog. The Move Node dialog appears. Enter the token in the New Token box. Note: It is not necessary to escape a negative token value; doing so results in an error: Invalid token. Tokens must be numeric. If the token is out of range, an error message indicates the valid range. Enter a valid token within the given range. The Move Node? dialog appears. During the move operation, the node is not available and cluster performance could be impacted. Click Move Node to confirm. The Moving node... message displays in the Move Node dialog.